5 Life Hacks To Make Singaporeans Happier? In part one, we pointed out that Singapore is facing an ageing population, and that immigrants are one solution to our shrinking workforce. Naturally, most citizens will not be happy with this. We need to recognize one thing; Immigrants are required because Singaporeans do not just appear overnight with the right skills, experiences, passion and most importantly, at the right cost. Multinational corporations are not likely to situate themselves in a country that demands for all their employees to be citizens. Neither does Singapore have enough successful startups to dictate the type of economy we want to live in. Yes, we can debate about why the Government is bringing in jobs that Singaporeans do not want to do. We can debate about the actual economic value that some of these jobs create for our country. But just like how individuals sometimes work jobs they do not like due to external circumstances, the same applies to our country. We don’t always get to choose the industries or companies that we would like to attract. And when we do attract the ones we want, we sometimes have to give in to their expectations. However as individuals, there are some ways you can get ahead of this game. Here are 6 ways we can think of. Despite the numerous views being published out there that paper qualification is not important in Singapore, we beg to differ. Here is why. Competition for jobs is high in Singapore, and this will only become worst in the future with the increasing population. Let’s all recognize that. Immigrants today are also getting more qualified. In the past, an immigrant with a diploma certificate may be able to get a job in Singapore, and do well for himself and his employer. Increasingly, the government is setting the bar higher, and with good reasons. As inflation of paper qualification continues to persist in the region, immigrants entering our country are getting more and more qualifed. Whenever there is a vacancy for a job and there are numerous applicants for the position, employers tend to make their decisions based on two factors: qualifications and level of experience. If you are 25-year old with a wealth of working experience, an employer may be willing to “overlook” your lack of education. Nevertheless, this implies not having the “right” education as being a severe disadvantage especially if you are going to compete with potential immigrants that have much better paper qualification. And because many employers are still superficial, not having the “right” qualification in the form of a degree is like losing half the battle. Being a ridiculously small nation with access to so many various job opportunities within our country, most of us are not familiar with the concept of moving really far away from our homes to get jobs we really like, or careers we want to pursue. If you are from China, Malaysia or even New Zealand, you will be forced to work the jobs that your parents or uncles did unless you are willing to move away from your home. That is because a lot of small cities in these countries can only support a few industries, unlike Singapore. Or you can do waitering at the local resturant. 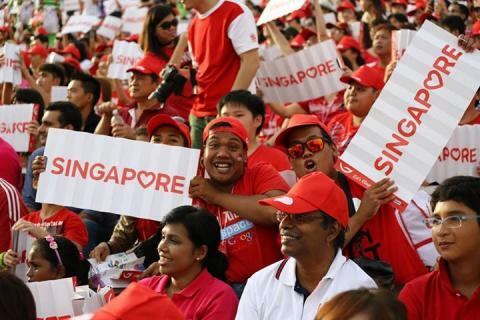 Singaporeans have an edge over our immigrant counterparts. This is in the form of our passports. Our passports allow us to travel to 170 countries without the hassle of applying for a Visa. Hence, if you are a young working adult with little commitment, go on and take up a job elsewhere in the world. You will have a greater chance of landing the job over your immigrant counterparts. Sadly for most Singaporeans, working overseas is never part of our plans; unless it’s Australia. The fact that Singaporeans probably speak the best English within Asia provides us with ample opportunities to work overseas. Speaking and writing good English opens up the entire America and Europe market. Our Mother Tongue such as Chinese, Malay, Tamil or Hindi provides even more opportunities in markets such as China, Malaysia, Indonesia and India. Coupled that with our passports and it’s a wonder why more Singaporeans are not working overseas. Perhaps it’s an outcome of Goh Chok Tong myopic “Are you a quitter or stayer” national day speech in 2002? Ironically, Goh Chok Tong daughter is working in the UK, which reinforces our point that Singaporeans should venture overseas more. With an ageing population, the next generation may face difficulties supporting their own families. Start planning for your retirement by building up towards a realistic amount of money that you wish to retire on, including what you will get from CPF Life. Adopt a healthy savings habit with a portfolio of investments. However, if you are very much a spendthrift or know little about investing, you may wish to consider a savings insurance to help accomplish that. Sufficient coverage of health insurance is important too, and it is always advised to obtain health insurance at a young age when one is still healthy as the requirements of qualifying for health insurances get much more stringent as one gets older. With our average life expectancy at 82 years old, it is perfectly normal that we start retiring later. We need to work that extra number of years to support the extra number of years we are expected to live till. Hence, staying in good health allows better productivity as we age, and also allows us to be less dependent on others. It is perfectly normal to feel unhappy about a policy if it appears to be showing more costs than benefits. Anyway, there is no perfect policy. So even as the government continues to find the right target population that Singapore can support and the most ideal policies to complement it, we should also start finding solutions to the possible problems we ourslves may face in the future. Let us know on facebook what else Singaporeans should do to be happier.